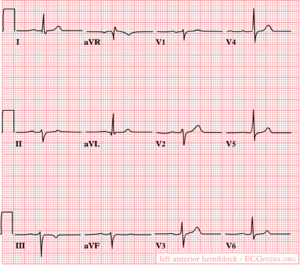 Click and drag the arrow in the above animation to change the heart axis and see how the ECG changes. The electrical heart axis is an average of all depolarizations in the heart. The depolarization wave begins in the right atrium and proceeds to the left and right ventricle. Because the left ventricle wall is thicker than the right wall, the arrow indicating the direction of the depolarization wave is directed to the left. For a lot of people, this is a difficult concept. The theoretical part seems difficult, but in working with it, the reader will find it becoming clearer. 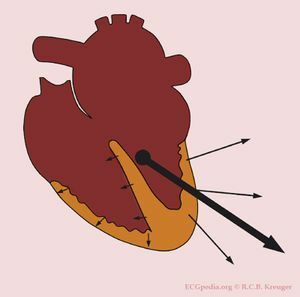 The heart axis indicates the average direction of the depolarization wave. A normal heart axis, the picture shows an example, is between -30 and +90 degrees. In this example, the heart axis is +45 degrees. 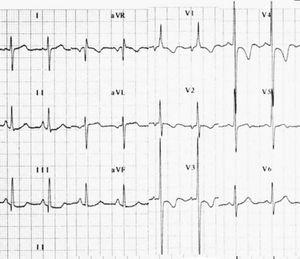 Positive QRS deflection in lead AVF: the electrical activity is directed down. This indicates a normal heart axis. Usually, these two leads are enough to diagnose a normal heart axis! A normal heart axis is between -30 and +90 degrees. 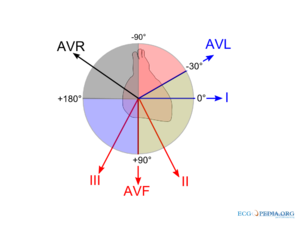 An extreme heart axis is present when both I and AVF are negative. (axis between +180 and -90 degrees). This is a rare finding. The largest vector in the heart is from the AV-node in the direction of ventricular depolarization. Under normal circumstances, this is directed left and down. (towards leads I and AVF). The position of the QRS vector is given in degrees. See the figure. A horizontal line towards the left arm is defined as 0 degrees. When the depolarization is perpendicular on the lead, this is called iso-electric. 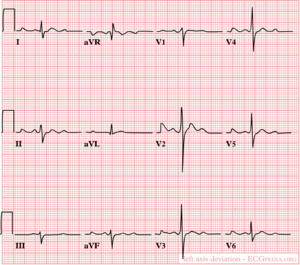 The QRS is neither positive nor negative. When all extremity leads are biphasic, the axis is directed to the front or back, in a transverse plane. The axis is than undetermined. Heart axis deviation to the left in case of an inferior infarct. Left anterior hemiblock is a common cause. A left axis is between -30 and -90 degrees. The axis is -30 degrees. 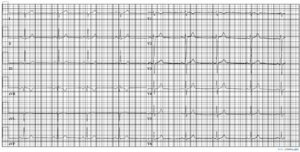 When the heart itself is rotated (right ventricular overload), obviously the axis turns with it. 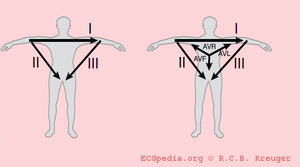 In case of ventricular hypertrophy, the axis will deviate toward the greater electrical activity and the vector will turn toward the hypertrophied tissue. In conduction problems, the axis deviates too. When the right ventricle depolarizes later than the left ventricle, the axis will turn to the right (RBBB). This is because the right ventricle will begin the contraction later and therefore will also finish later. In a normal situation the vector is influenced by the left ventricle, but in RBBB only the right ventricle determines it. This page was last edited on 23 June 2013, at 20:39.